When bags get in the way, luggage storage solutions can help lighten your load and free you up. Amsterdam 🇳🇱 is one of the busiest cities in Europe, bustling with authentic shops and night-time fun. Millions of visitors walk the narrow streets of Amsterdam many of whom are in search for luggage lockers. So, next time you’re wondering “where can I find luggage storage near me” in Amsterdam, look no further! Here at Stasher, we’ve created an Amsterdam luggage storage guide ℹ️ to help you work out where you can keep your bags safe for the day. Especially because Amsterdam can famously make you forgetful and...I’m sorry, what was I saying? 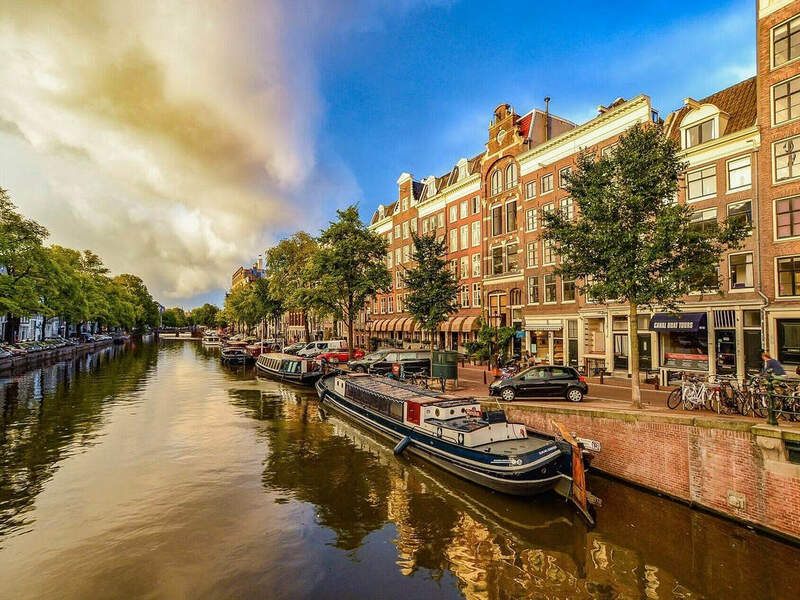 Stasher has built a network of shops and hotels all over Amsterdam (StashPoints) where customers can book affordable and convenient storage as an alternative to luggage lockers or more expensive luggage storage shops. Each StashPoint has been vetted for security by our team, and each item you store with us is fully insured. All you have to do is book online, drop off your bag and enjoy the rest of your trip like a boss! How much does it cost to store your luggage in Amsterdam? Where are the StashPoints for my luggage in Amsterdam? Our network of local businesses provides you with affordable luggage storage anywhere you are in Amsterdam. The city’s major transport hub is Amsterdam Centraal, the nearby square, Dam Square is the heart of the town, and all road leads back it. Key attractions like the Red Light District 🚨👯‍♀️ are all near the city centre. Also, if you're looking for information about the lesser known parts of the city, check out our "Off the Beaten Path" guide for Amsterdam! Here are some of the areas you can find a StashPoint near you in Amsterdam. Click for a full list and a map of our Amsterdam StashPoints! Storing your luggage in Amsterdam with Stasher is easy! In three simple steps, you are ready to enjoy everything Amsterdam has to offer! Centraal Station is the main transportation hub of Amsterdam, as it connects the city with Schiphol Airport and the rest of Europe. Storing your luggage in the Centraal Station lockers is practical but can be quite expensive. There are luggage lockers at Central Station, simply look for signs that say “Bagagekluizen”. They are in the East wing of the station – the right side of the building looking from the city centre. The self-operated lockers come in two sizes, small and big. The maximum storage period is nine days. Bear in mind ⚠️ these luggage lockers are conveniently located but not cheap. Moreover, during busy times these storage lockers do fill up, and you might be turned away. Rates for small lockers are €7 for the first 24 hours. Bigger-sized lockers at Centraal Station cost €10 for 24 hours. There is a penalty for leaving your belongings there for longer than nine days, so make sure to arrange an alternative if you need long-term storage. The Centraal Station is only a short walk away from all major attractions, including Anne Frank’s House, the Dam Square, Red Light District and some of the city’s most famous bars. Connections to the rest of the Netherlands and neighbouring countries depart daily from Centraal, so the area is busy at all times. Despite it being in the capital, Amsterdam Centraal station is the second-largest and second-busiest in the nation, surpassed by Utrecht Centraal. The Amsterdam Centraal Station first opened its gates in 1889 and was designed by the Dutch architect Pierre Cuypers. The architectural style of the main building is Gothic/Neo-renaissance and features a cast iron platform roof that measures about 40 meters. Schiphol Airport is one of the most modern in Europe. However, it is not the most practical when it comes to luggage storage. Below you can find some information about luggage storage in the Schiphol Airport Baggage Depot. There are luggage storage facilities at Schiphol Airport in 6 different locations. They have baggage lockers for smaller items such as briefcases and bags, as well as a baggage deposit for awkwardly shaped items or large boxes. Lockers are located after security, while the Baggage Depot is in the basement between Arrivals 1 and Arrivals 2. Maximum storage period is 30 days. The Schiphol Airport Baggage Depot is open 24/7. If you lose your receipt, you will be charged with an extra fee of €8. Also, there is no easy way to get your luggage if you forget them in the Baggage Depot and pass through security. Schiphol is the third-busiest airport in Europe, and it is an overall interesting place to be (as far as airports go). With hundreds of restaurants, bars and shops operating in the premises, you will have no problem finding something to keep you occupied while you wait for your flight. The airport is relatively close to the centre of the city, with frequent bus and train routes to central Amsterdam and other smaller towns nearby. There are also high-speed railway connections to major cities, such as Brussels, Lille, Paris, Antwerp and Marseille (during the summer months). Schiphol has one large terminal where all of the facilities are located within three interconnected sections. There are around 165 boarding gates, including 18 double jetway ones for larger aircrafts like the Emirates A380. Here are some other luggage storage options around the city of Amsterdam. Stasher is more affordable than most of the other options around the town, but it is good to know about other alternatives.